The invention of the phonograph by T. Edison in 1877 makes it possible to record a sound burning a furrow on a wax cylinder. So as it works perfectly, the sound origin (musical instrument, voice, etc.) has to have a high enough volume. It is not the case with the violin, which does not have a powerful sound. Pragmatically, in 1899, the engineer A. Stroh applied for a patent that increase considerably the directivity of the violin sound, which allows it to address clearly a recording phonograph. A. Stroh suggests major changes of the classic wood violin, leading to the birth of the Stroh-violin. – A rigid frame whose only aim is to maintain and to tune the 4 strings of the instrument replaces the sounding board. – The bridge movement is modified to favour the rotation around an axis that is parallel to the strings. – In this way, the bridge is linked to a membrane between the strings and the acoustic horn. This pipe, borrowed from brass instruments, amplifies the sound. 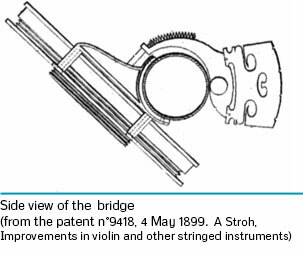 The feet of the Stroh-violin bridge are fixed on an axis which enables the bridge to oscillate laterally. Through friction with the violin bow, the string moves and transmits to the bridge a vibration, which is then transmitted to the membrane where the bridge is connected. In this way, the bridge rotation is converted into a translational movement for the membrane as a piston. 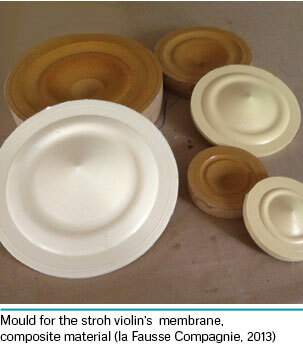 All the components of the acousto-mechanical line aim to enable the Stroh-violin membrane to oscillate. This membrane act thus as a loudspeaker – it has to be light and rigid. To get that right balance, we did numerous trials with various materials and geometry concerning the central cone and the folds – that assume the role of suspension. The vibratory movements of the membrane set the horn internal air column in motion. 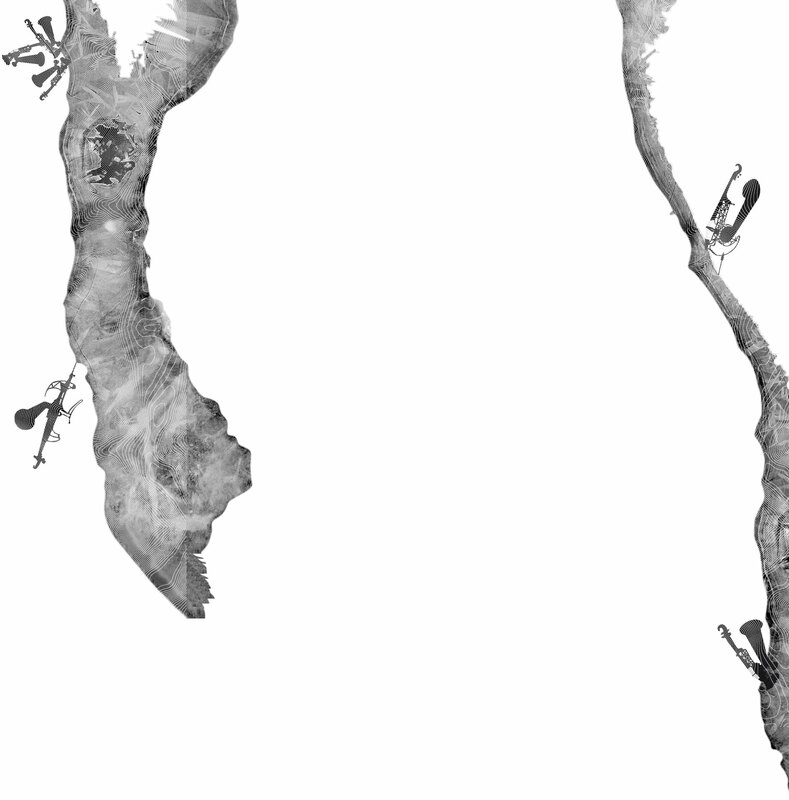 The horn generates a particularly directional acoustic radiation, as that of the trumpet or trombone. 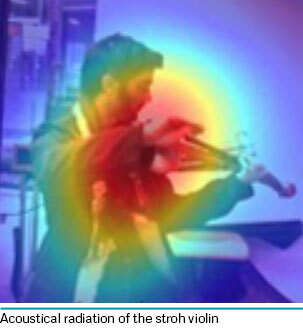 This device is, incidentally, so directional that the musician experiences difficulties to hear his own sound. Stroh added a smaller accessory horn for the musician to have a sound feedback. In view of the high directivity of the Stroh-violin – that can be clearly seen when the musician moves beside the public – this instrument is much easier to record by means of a phonograph than a classic violin. 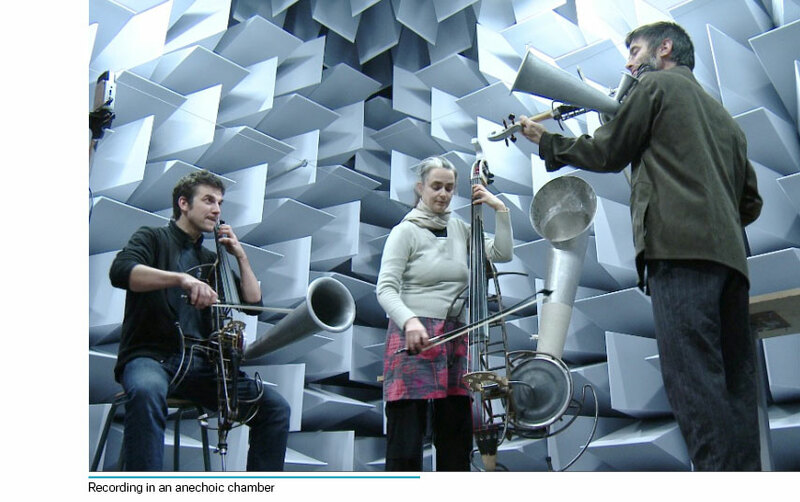 Find out more on the acoustic studies of the ENSIM and LAUM about the Stroh instruments.